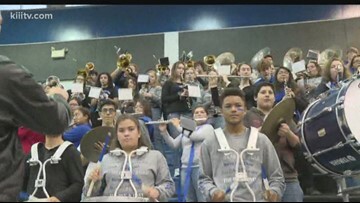 Kiii Sports Reporter Travis Green attended an Ingleside High School pep rally Friday and presented them with their banner. 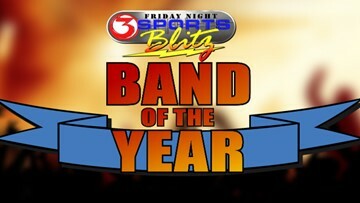 Friday Night Sports Blitz "Band of the Year": vote now! These are the the 11 winners from each week this season, listed alphabetically. 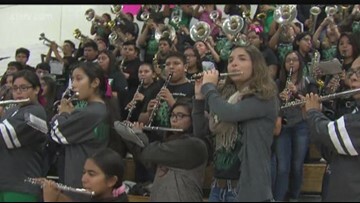 Week 11 "Blitz Band of the Week": Sinton or Ingleside? Who should be our "Blitz Band of the Week" for week 11 of the 2018 season!? Sinton or Ingleside? Week 10 "Blitz Band of the Week": Ray or Miller? Who should be our "Blitz Band of the Week" for week 10 of the 2018 season!? Ray or Miller? Kiii Sports Reporter Travis Green attended a Gregory-Portland High School pep rally Friday and presented them with their banner. 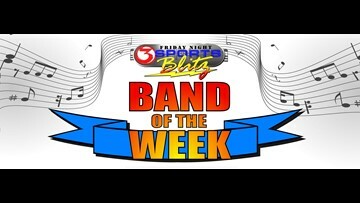 Week 9 "Blitz Band of the Week": Gregory-Portland or Calallen? Who should be our "Blitz Band of the Week" for week 9 of the 2018 season!? Gregory-Portland or Calallen? Kiii Sports Reporter Travis Green attended a Falfurrias High School pep rally Friday and presented them with their banner. Football season continues in the Coastal Bend, and on Friday the Falfurrias High School band was awarded for becoming our Blitz Band of the Week! 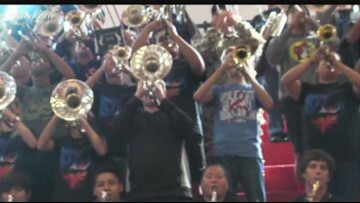 Week 8 "Blitz Band of the Week": Taft or Falfurrias? Who should be our "Blitz Band of the Week" for week 8 of the 2018 season!? Taft or Falfurrias? 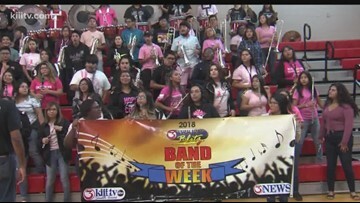 Football season continues in the Coastal Bend, and on Friday the West Oso High School band was awarded for becoming our Blitz Band of the Week!